Holding their their first major mega rally in Ahmedabad on Sunday, Gujarat's Dalit rights groups kept at bay major political parties, including Congress, BJP, Aam Aadmi Party and Bahujan Samaj Party. The show of strength, in which thousands from Ahmedabad, Saurashtra and North Gujarat thronged to participate, was held to protest against the brutal thrashing of Dalit youths on July 11 in Una, where they were attacked by cow vigilantes. 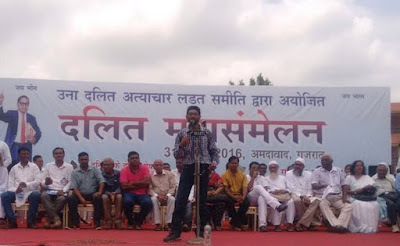 Calling for the rejection of the Gujarat model which allegedly seeks to "encourage" atrocities" against Dalits, the organizers – under the umbrella body Una Dalit Atyachar Ladat Samiti – admitted that they kept political parties away as they have "failed" to give any justice to the Dalits. These political parties were merely interested in taking political advantage of the Una event against the backdrop of the forthcoming elections in Punjab and Uttar Pradesh, where Dalits form 26 and 21 per cent of the voters, as against Gujarat's just 6.7 per cent. The BJP, it is well-known, had characterized the Una incident a “law-and-order problem”, sought to be whipped up by Rahul Gandhi, Arvind Kejriwal and Mayawati with an eye of polls in Punjab and Uttar Pradesh. The rally began about one-and-a-half late, at 1.00 pm, as the ground got filled with rainwater at several spots and the stage had to be shifted. A Dalit BJP corporator, present at the in her individual capacity alleged that the spot was allocated to ensure that the rally failed to succeed. "The cops picketing on the highway at several spots created hurdles and did not allow Dalits in trucks to enter Ahmedabad", she said. Held a little-known ground near Torrent Power Plant in Ahmedabad's after the cops kept the rally organizer guessing for several days about the required permission, the star attraction at the rally were the family members of three Dalits who died in Thangadh police firing in Gujarat's Surendrangar district in 2012. Several Muslims activists also participated. There were slogans at the meet such as "Hindu-Muslim keta zindabad" and "Dalit-Muslim ekta zindabad". 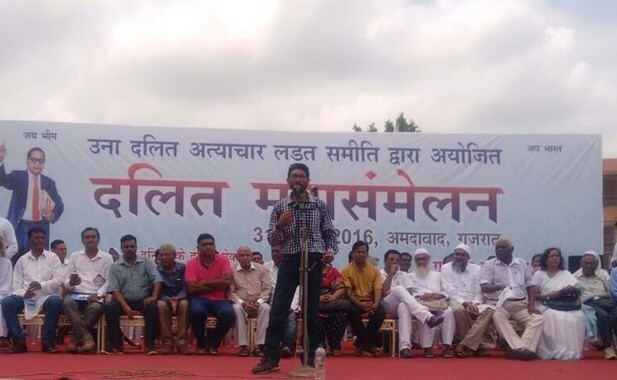 Addressing the rally, Jignesh Mevani, convener of the Ahmedabad rally, said, "The state government and police had been trying to prevent Dalits from uniting and coming under one banner, but considering the anger and mood of Dalits, police had to surrender and allow us to hold the event". Mevani, who is a young Dalit rights advocate, also called upon the Dalits to stop scavenging dead animals and manual enter into the gutters to clean it. "We must apply to for licensed firearms to protect ourselves, as the government has failed to do it", he said. He added, "What would you expect from a government which has failed to even charge sheet the accused in the Thangadh police firing? You cannot expect justice for Una either. We want the government to institute anti-atrocities Act against the Una culprits." A charter of demands for Gujarat Chief Minister Anandiben Patel announced at the mega rally included quickly arresting those who attacked Una Dalits as per provisions of Prevention of Anti-Social Activities (PASA) Act, so that the attackers were not set freely unless reviewed by a High Court committee, and arresting all those who are seen thrashing the Dalits in the videos that went viral, as also the cops and the sarpanch knew of and were “involved”. The demands further insisting on providing alternative employment those Dalits who give up the “undignified” job of skinning dead animals, and the to safai karmacharis engaged in “inhuman” job of manual scavenging, and providing housing units to Dalits in urban areas, because they are even today “socially boycotted, discriminated against and exploited socially, economically and sexually in Gujarat's villages. “We want the chief minister to discuss these issues across the table with Dalits. 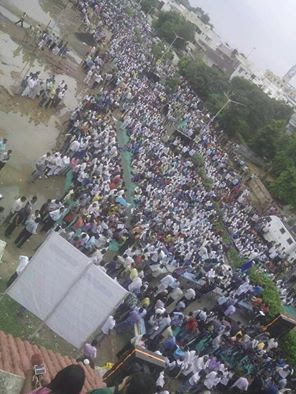 Till our demands are met, the demonstrations across Gujarat will continue. If the chief minister could meet the Patidar leaders, why can't she meet us?”, asked Mevani. The BJP government in Gujarat appeared fearful of the political fallout of mahasammelan. Chief minister Anandiben Patel appealed for peace, saying, with reference to the rally, “People with with vested political interests are trying to divide communities and disrupt peace in state." There was a heavy police deployment at the spot of the rally under DCP , who included four ACPs, 10 inspectors, 20 sub-inspectors, five woman sub-inspectors, 175 ASI to constables, two companies of State Reserve Police (SRP) and two platoons of woman SRP company. In addition, were riot control vehicles, quick response teams, CCTV cameras and videographers.